Lisa from Talk Functions shares one of the fantastic weddings she planned for Natalie and Matthew. Natalie & Matthew chose a destination wedding in sunny South Africa which suits their outdoor personalities. They are a fun loving couple who enjoy the country side and participate in many sporting activities. Matthew went for a mountain bike ride in the early hours of his wedding day with his groomsmen at his side. Natalie threatened him that there will be no wild mountain biking antics especially on their big day! Thank goodness he arrived back in one piece and arrived at the ceremony on time. Natalie wanted me to create an intimate, romantic and relaxed day with an African vibe. She wanted elegance and simplicity. 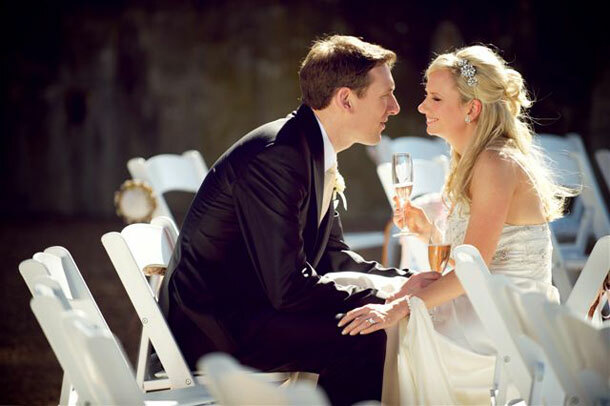 The ceremony and reception took place at La Petite Dauphine in Franschhoek known as the “French Quarter”. The area is also know for its fine wine and good food which were high on Natalie & Matthews priority list. As the guests arrived they had an arrival drink of rose & mint water placed in beautiful bottles decorated with a welcome tag. The garden ceremony was held under the old oak tree which provided much needed shade on a hot summer’s day. It was fitting to have a garden ceremony since many of their guests came from London were a garden wedding is rare. An African Choir welcomed the bride down the aisle with their lovely melodic voices. The Reception was held inside the beautiful venue room with its old world charm so we did not have to do too much since the room was already decorated. Lighting was very important so we incorporated chandeliers, fairy lights and lots of candles to create a warm and inviting ambience. The décor was a combination of feminine, masculine and African. We incorporated bold stripes in the stationery and linen which emphasized the masculine part of the design elements. The guests were treated to a delectable sit down dinner and then later indulged in a dessert feast of decadent cakes of different flavors. The midnight snack was a cheese board with an array of local cheeses & preserves from the area. The band kept the guest on the dance until the early hours of the morning. The talented Ryan Graham Photography captured the day and its emotions perfectly.